As temperatures plummet and people across the UK battle treacherous conditions, what can you do to keep you and your home warm, and stay safe on the roads? How can I best heat my home? The NHS advises keeping your home at the recommended temperature of 18 to 21C (64 to 70F). If you cannot heat all the rooms you use, heat the living room during the day and the bedroom just before you go to sleep, it says. The recommended temperature for older people is 21C (70F), says Help the Aged. The charity says if bills are a problem, older people might have to live and sleep in one room, so it advises asking friends or family to move the bed into the living room rather than sleeping in an armchair. Keep curtains drawn and doors closed to block out draughts. Home Heat helpline advises on making sure radiators and heaters are not blocked by furniture or covered by curtains. Take care not to block air vents or grilles even if you feel a draught coming through them. Draughtproof the front door with a well-fitting curtain and fix draughtproofing strips to windows and the bottom of external doors. Leave a small section untreated around windows to let in fresh air. Attach plastic film or sheeting to the window frame and seal gaps between floorboards and around skirting boards with sealant or thin wooden strips. What can I do to look after my family? The NHS is advising people to have regular hot drinks and at least one hot meal a day. Help the Aged has published a free advice leaflet called Healthy Eating. Keep as active as possible. Help the Aged urges older people to get their circulation going with housework or walking to the shops. Those with difficulty walking should keep moving arms and legs and wiggle fingers and toes. Wrap up warm if you need to go outside on cold days. Wear several light layers of warm clothes, rather than one chunky layer. Clothes made of wool, cotton or fleecy synthetic fibres are usually warmer. At night, use a hot water bottle or an electric blanket to warm your bed up. Never use the two together as it can be dangerous. Check up on friends, relatives and neighbours, particularly the elderly and people with serious illnesses. People with heart or respiratory problems may have worse symptoms during a cold spell and for several days after temperatures return to normal. What can I do to look after my home? If you're going away for a few days, British Gas advises setting your central heating to come on twice a day at a low temperature to avoid freezing and burst pipes. 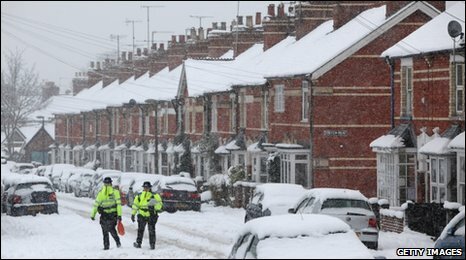 The Met Office advises putting grit or cat litter on paths and driveways to lessen the risk of slipping. If your boiler is located in an outhouse or garage, it is more susceptible to freezing temperatures at night when off. British Gas recommends having a frost thermostat valve fitted, which automatically switches it on if the temperature drops dramatically. Are there any benefits I can claim to help with bills? Some pensioners, people on income support, those with disabilities and certain carers may be entitled to a cold weather payment. These one-off payments of £8.50 are made automatically when the average temperature is recorded as, or forecast to be, 0C (32F) or below over seven consecutive days. If conditions are particularly severe, the government has said it will increase it to £25 this winter. Separately, people aged 60 or over who normally live in the UK are eligible for a tax-free annual winter fuel payment. It is usually paid from November and the amount varies. In 2008-9, payments for over-60s rose to £250 and to £400 for the over-80s. If you have not had the payment before and are not getting a state pension or another benefit (apart from housing benefit, council tax benefit or child benefit), the payment will not be automatic. You can apply by calling 08459 151 515 or go to the Direct.Gov website. What can I do to keep my car running? Driving in severe winter weather poses many challenges but there are ways to keep your car on the road and moving. Ensure your tyres are inflated correctly and that you have a minimum of 3mm of tread on your tyres to cope with wet and slippery conditions. Batteries run down more quickly in the cold so make sure to top them up or trickle-charge them. When starting the engine, depress the clutch as this will reduce drag on the engine and preserve the battery. Keep topped up with screenwash and use a proper additive at the right concentration to prevent it freezing. Keep your fuel tank topped up - that way if you are caught out, you will have enough fuel to make it home or run the engine to keep warm. Clear all snow and ice from the windscreen before driving. Do not use water to de-ice windscreens. Hot water can crack the glass, and the water will only freeze again on the screen or on the ground where you're standing. A squirt of WD-40 will prevent your door locks freezing up. What should I take on car journeys in case I get stranded? Always pack a warm coat, hat, gloves, sturdy boots and a blanket to keep you warm if you get stuck. Take some food such as chocolate or biscuits, water and a hot drink if you can. Always carry a fully-charged mobile, some old bits of carpet or cat litter to put under the tyres when stuck and a shovel to clear snow. Jump leads, a first aid kit and a torch may also come in handy.